Operation of Distributed Energy Resources in Smart Distribution Networks defines the barriers and challenges of smart distribution networks, ultimately proposing optimal solutions for addressing them. The book considers their use as an important part of future electrical power systems and their ability to improve the local flexibility and reliability of electrical systems. It carefully defines the concept as a radial network with a cluster of distributed energy generations, various types of loads, and energy storage systems. In addition, the book details how the huge penetration of distributed energy resources and the intermittent nature of renewable generations may cause system problems. Readers will find this to be an important resource that analyzes and introduces the features and problems of smart distribution networks from different aspects. Kazem Zare received the B.Sc. and M.Sc. degrees in electrical engineering from University of Tabriz, Tabriz, Iran, in 2000 and 2003, respectively, and Ph.D. degree from Tarbiat Modares University, Tehran, Iran, in 2009. Currently, he is an Associate Professor of the Faculty of Electrical and Computer Engineering, University of Tabriz. His research areas include distribution networks operation and planning, power system economics, microgrid and energy management. Sayyad Nojavan, PhD, is an Assistant Professor in the Department of Electrical Engineering, University of Bonab, Bonab, Iran. His research areas include distribution networks operation, power system operation and economics, electricity market, hybrid energy system, retailer, microgrids, and risk management. 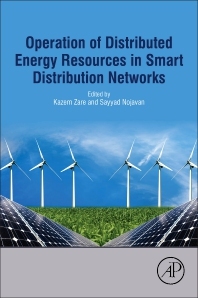 He has also edited several books in the energy field, including Operation of Distributed Energy Resources in Smart Distribution Networks. This book contain some issues about DER participation in distribution networks. So, I think it can be a good reference book in this field.